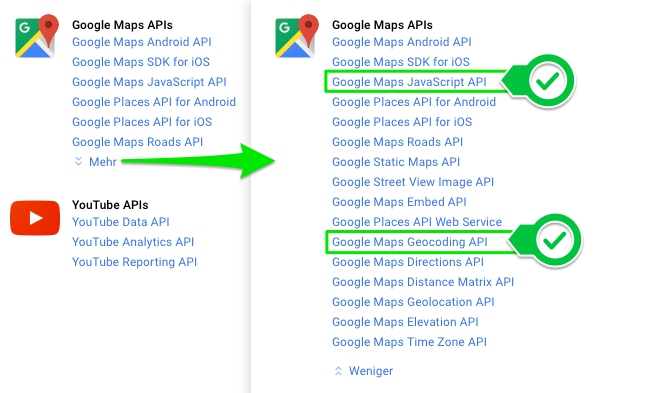 Google provides the Googlemaps service for free, but — probably due to a change of the policy — Since June 22nd 2016 , an API key is required for all new GoogleMaps API projects. If there is no such key, the maps will not be displayed. Instead you will see an error message. Did you create and publish a Geommunity Map and then don't see a map but a warning like the following? In this case there will probably be one or more error messages in the "console" of your browser. If you don't have a Googlemaps API yet, go to https://console.developers.google.com/apis and create one.If you don't have such an account yet and feel unsure about how to create it, please ask your site's webmaster for assistance. The "Geocoding" API is responsible for translating a literal address (with a street and city name for instance) to a location on the map. It is not to be confused with the "Geolocation" API! (Thanks to "lousyfool" for pointing that out.) So if you wonder why entering an address to set the marker doesn't work, a missing or wrongly configured "Geocoding" API is most likely the cause. Important: Depending on your domain, your Google account and several other aspects these settings could be different! Update:User "pawell" states that the "Google Places API Web Service" is also important to find an address. So activate this feature as well. Where in doubt about the API and how to create or configure it, please refer to Google's manuals or ask your site's webmaster for assistance.Once this is taken care of, the Googlemaps should be displayed as expected. Created on 11 January 2017 . Last updated on 11 January 2017 .